Pook’s Lodge Hill is a small eco-lodge in the heart of a 300 acre primary rainforest reserve in Western Belize specializing in truly authentic jungle experiences in a breathtaking natural setting. The lodge borders the 6,700 acre Tapir Mountain Nature Reserve and the Roaring River and is 4 miles from the world famous ATM Cave. The Lodge was developed to preserve and maintain the primary rainforest that serve as a buffer zone to the Tapir Mountain Nature Reserve and to help visitors to the lodge develop a greater appreciation of Belizean rainforest ecosystems. Our eleven thatch cabanas surround an ancient Maya site and look out over the jungle canopy. 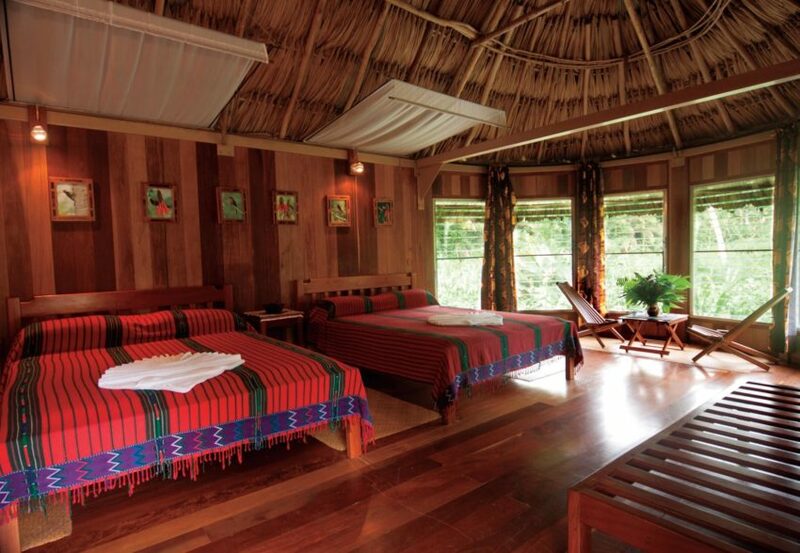 Each has a private bathroom with hot water and 24 hour electricity, providing comfort in the jungle. 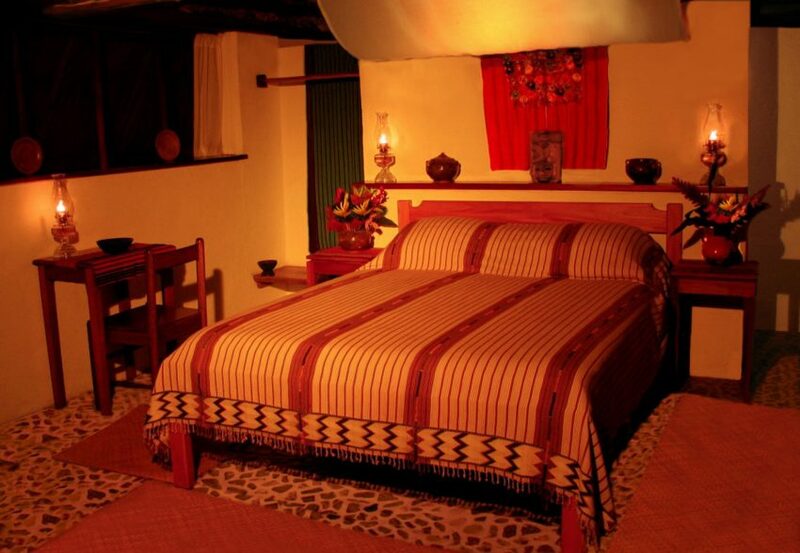 All management and operations at Pook’s Hill Lodge are carried out according to sustainable business practices. Restaurants- Meals are served in the lantern-lit dining room overlooking the forest canopy. Belizean and European dishes are served buffet style. Nature – Pook’s Hill Reserve is a delight to explore. Hike past giant mahogany and under tangled lianas on our jungle trails. Discover the various medicinal plants, orchids, palms, hardwoods and the diversity of the insect and animal wildlife that use the rainforest of Belize. Standard Double Cabana feature 1 queen bed and 1 single bed, with the option for an additional single bed upon request. 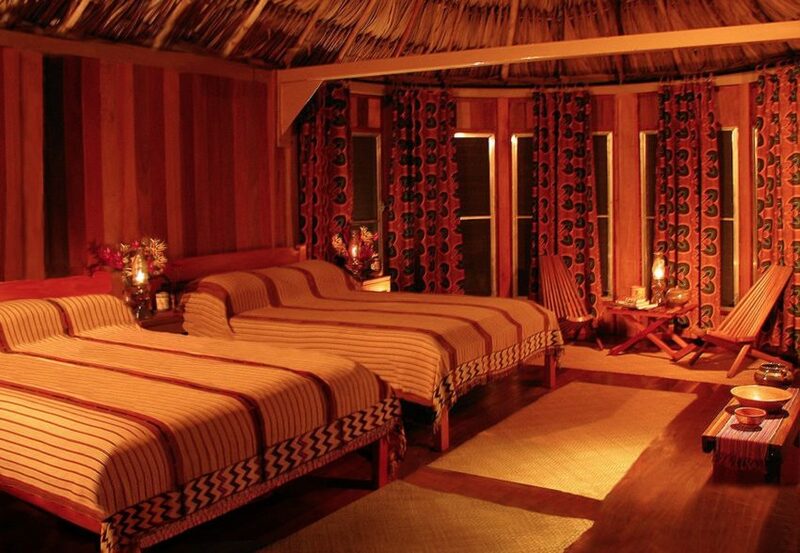 These cabanas are located near to our lodge and dining hall with a rainforest view. Also available with 1 queen bed and a view of the Maya Plaza. The Family Cabana is comprised of 2 units, which are separated by a dividing wall. Each unit has its’ own private entrance and features 1 queen bed and 1 single bed, or 2 single beds. Each unit has it’s own private bathroom. Bird Walk Cabanas feature 2 queen beds, with the option for an additional single bed. They are set across the creek on platforms 20 feet above the forest floor providing excellent views of the jungle. They are accessed by a raised walkway through the trees and are our most spacious cabanas.